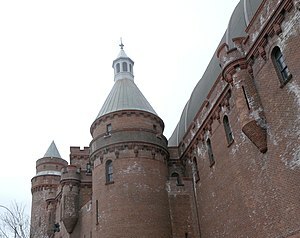 The Bronx is about to get another chance to lift the curse of the Kingsbridge Armory, with two new proposals to develop the site. But it will have to overcome stiff opposition by the local soviets that have thwarted commercial enterprise at the “people’s armory” for years. Only two years ago, recall, Bronx Borough President Ruben Diaz’s insistence on a special minimum wage scuttled a plan for the armory by the Related Company that promised 2,200 jobs. But The Bronx never misses an opportunity to miss an opportunity. Some just resist change. Others — like the local activists who’ve been trained in the spirit of leftist organizer Saul Alinsky — don’t even need an excuse. Then there are shakedown artists, who’ll demand the usual bribe: the “community benefits agreement,” in the form, perhaps, of another blanket “living wage” minimum or funding for a school or preferences for locals. They’ll cite bogus “concerns” until the developer caves — and then brag of their big victory. Unless, of course, the developers walk, as Related did — and The Bronx loses out yet again. Bronx residents can’t afford to let that happen this time. Fortunately, both Mayor Bloomberg and Diaz now appear determined to check off the armory as done on their “to-do” lists. And two promising proposals have emerged. The first is the Kingsbridge National Ice Center — a plan for a world-class ice-hockey and skating-sports facility featuring nine rinks and an ice-sports-themed middle school. The second is an indoor Times Square-style commercial venture anchored by small retailers, a cineplex and a Crunch Gym. Either would mark a huge step forward for the borough. Yet, predictably , the Luddites are already vowing to fight any possible good news. Insiders, for instance, think the ice center will get the nod. If so, critics will charge that Bloomberg and Diaz greased the skids in favor of NHL legend Mark Messier and Olympic champion Sarah Hughes, who are behind the project. They’ll revive the ESPN E60 report on the dangers of “carbon monoxide, nitrogen dioxide or ultrafine particles” from poorly maintained Zambonis. They’ll scaremonger over the idea of nine ice rinks using ammonia-based refrigeration systems. The’ll raise faux safety concerns by citing an ice-house in Florida that exploded when ammonia gas leaked. Such warnings may sound laughable in a borough that already suffers the highest childhood-asthma and COPD rates in the city. But lamer notions have killed even more exciting plans in New York. Yet the National Ice Center may represent just the kind of out-of-the-box thinking that will bring the borough positive attention, not to mention 3 million visitors annually. The second bid, for the commercial center, comes from immigrant real-estate entrepreneur Young Woo — who certainly has the imagination and financial chops to make it a success. Like his planned Pier 57 redo, Young Woo’s Armory concept is an artsy open-air market with rental space for artists and small businesses. The plan revolves around a “zocalo,” or town square — a dynamic reflection of its host community. Two years ago, Forbes magazine described Young Woo as having a feel for the pulse of New York. The same can be said of his armory plan, which intends to capture the frenetic energy of The Bronx and relocate it indoors. Alas, that positive, caged excitement is exactly what some Bronx leaders don’t want. Like survivors of some terrible violence, some of the old-timers wrongly believe that embracing something new means betraying those who didn’t survive the trauma of arson, drugs and economic dislocation that long wracked Bronx neighborhoods. The fact is, The Bronx will never turn the economic corner until more of its people let go of the familiar and embrace a bold future. The hope is that the shakedown attempts, the scare tactics and the fears of change won’t be enough to “ice” either plan. Bronxites must stand up to the activists and extortionists. We must cease picking at old psychic wounds and embrace an unfamiliar, but hopeful, future. Too much is riding on redeveloping the Kingsbridge Armory, changing The Bronx’s trajectory and making it a destination point for the greater community. Bloomberg and Diaz must be allowed to build something — finally — to attract new life and offer hope to those who live here. Great article, Mr. Benjamin’s analysis is “dead on”. We do need change in the Bronx, I personally love Mr. Woo’s idea, we do need a retail space for local artisans and crafters, however which ever proposal is accepted I also hope that Mr. Bloomberg and Mr. Diaz will be able to finally realize the dreams of so many Bronxites and develop the armory and in so doing create the much needed jobs here in the Bronx. the premise of this article is despciable. the people of the bronx don’t ‘naysay’ for the sake of naysying. they do it because historically their representatives and developers don’t have their community’s best interests in mind when they cut deals. unfortunately, in many cases their concerns have been proven to be justified… and so to wipe away issues they might raise in the future with a sterotypical assumption is a dangeruos notion. so, yes, we need the right development in the kingsbrdige armory… and all over the bronx. but if there’s something wrong with a proposal then i urge ALL bronxites to stand up and be counted andn make sure things are done right before they accept anything less. i assure you, #1, i will be standing right with them and #2, i will provide a responsible public forum to shed light on their contentions. young woo id love the chance to open up a concession stand if the price was right- I support the use of the armory as a retail space for local artisans and crafters and designers much like the revival of the old limelight club in nyc which has been revamped as a retail space for local small businesses. The key point here is that the National Ice Center will attract 3 Million visitors annually. The neighborhood is already over saturated with retail. The Market Mercado will only hurt the Fordham Road Business District. k from the Kingsbridge Armory. So I would say that I have some insight into the needs of the community. The National Ice Center would bring people throughout the region into the neighborhood and bolster the local economy. NYC has 8.5 million residents and how many year-round venues to go ice skating??? As someone affiliated with Columbia University you might be interested to know that the girls figure skating team practices in Hackensack, NJ. Perhaps, that would change if the ice center opened. You could open up a designer cupcake store nearby to sell to them and the other 3M+ visitors. Otherwise, you might want to consider locating down by Yankee Stadium because somehow I don’t think designer cupcakes are going to be flying off the shelves in Kingsbridge otherwise. This entry was posted in Economic Development, Government, Public Policy and tagged Kingsbridge Armory, Mark Messier, Mayor Bloomberg, Ruben Diaz, Sarah Hughes, Saul Alinsky. Bookmark the permalink.